. 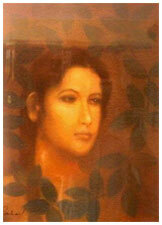 :: Suhas Roy - Abode of Creativity ::. 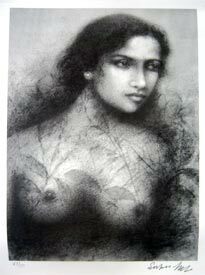 SUHAS ROY: He studied at the Indian College of Arts and Draftsmanship,Calcutta, and under the tutelage of Prof. S.W. Hayter at the Atelier 17 Ecole Superior Des Beaux Arts, Paris. His works have been exhibited allover the world through exhibitions like the Asian Graphic Prints Traveling Exhibition, USA, the Tokyo Print Biennale, Japan, Contemporary Indian Art,Yugoslavia, Romania, Czechoslovakia, Hungry, and Wounds, at the Central Institute Modern Art, New Delhi, and the National Gallery of Modern Art, New Delhi. 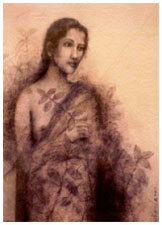 Roy lives and works in Santiniketan where he is the head of the Department of Painting at Kala Bhavan, Santiniketan. His craftsmanship and consummate skill that ensure that his richly romantic subjects do not touch extreme syrupy and stereotypical portrayals. Instead, their very patent beauty veers towards melancholic grace and elegance. This graceful portrayal of his subjects has much to do with his choice of refinement. The mystical flavour of his works arose from his materials - his crayons, charcoal and brush have sensitivity and interpretations of the 'unknown'.